Its a bit windy here in Blackpool because of the tail end of hurricane Katia (just how do they come up with the names?) 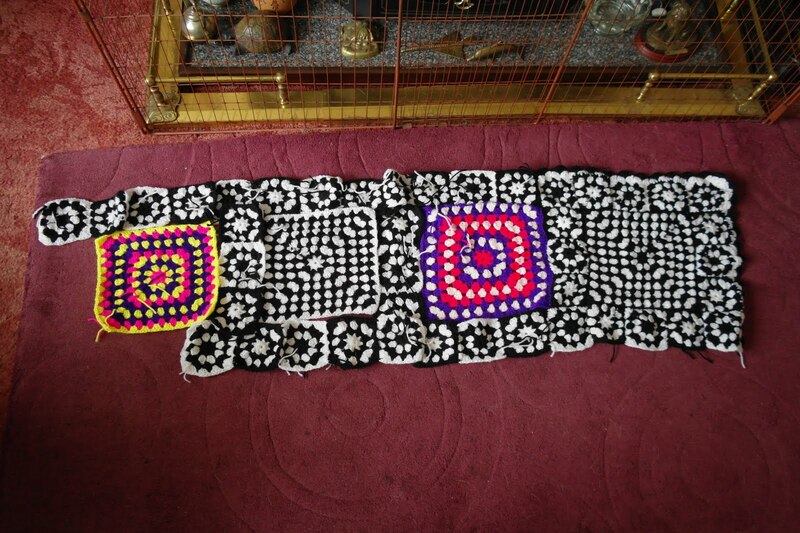 so I have decided to stay in an do a bit of blogging and crochet. 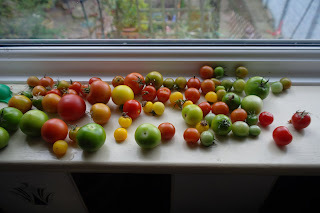 I did venture out this morning to pick some tomatoes from the greenhouse, some have fallen off because of the mouldy, furry stuff that seems to have infected the plants but the green ones should ripen up on the window sill. I have had quite a good amount this year and less have split which I think is due to me watering them less but more often. I went to visit my bf in Warrington Friday night and Saturday we went to The Blue Planet which is an aquarium at Ellesmere Port. I thought it was quite expensive but at the same time I guess it is costly running a place with so many tanks and animals to look after. I did have a great time though, the sharks were fab and I got to stroke a ray (lucky ray *smirk*) which was strange- they are rough on the back and very smooth underneath. I love how smiley they look :) I have read some bad reviews on tripadvisor about Blue Planet, some saying that it doesn't take long to walk around, yes that's true if you walk past everything and just have a quick look, but if you stay a while at each tank, read the information and just watch the animals then you can be in there a good few hours. I have made some progress with the Epic Beadspread. It really isn't coming together as fast as I would hope but its fun and that's all that matters really. 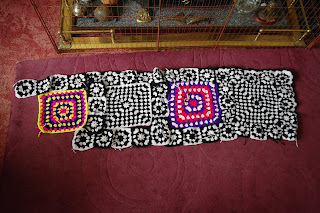 This photo shows what I have done up to now, I still have to sew everything together and do the edging and seeing it laid out like that made me realise that if I'm going to make it 6 big squares across and down that it is going to be huge! I've been doing a lot of thinking this past few days after all the furore over at folksy and the enforcing of THE RULES. From what I can understand, they are tightening up on what is and what isn't classed as handmade and what can and can't be offered for sale on Folksy. Now I can understand that if a person buys a necklace from a shop, adds a few pounds and puts it for sale on Folksy, then that is wrong (and I'm not saying that has been happening) but there have been some lovely shops that have been told their items aren't handmade enough to be listed.The thing is I can't see the reason they have to be de listed after November and that's what is making me a bit wary of listing anything else, when I make I have an idea of what I want to do and then it sort of evolves into something else, I don't sit there and think, 'I must not make the pendent the focus of attention because it is mass produced and that isn't allowed' I just make what feels right. I was attracted to Folksy because it seemed a friendly place and was British based, I just hope it doesn't become elitist with a 'mine's more handmade than yours' attitude.There is also no way I am reporting items I see that I think (and again it seems such a fuzzy area) don't completely comply to the handmade criteria. I had my first sales on there Tuesday and I was really happy to be there until it all kicked off this week...I think the way it has been handled has been awful and there are some people who have had shops on there (and selling lots and paying the commission and listing fees) for years, who must be very, very upset. Anyway, after that rant I am off to have a look at all the talented crafters at 1stuniquegifts. Have a brilliant Handmade Monday everyone. Your window sill looks exactly like mine - tomatoes everywhere. The beadspread looks good - a lot of hard work for you I would think. It's funny to me to think that hurricanes that start way down here (and actually far south of us) end up way up where you are! Anyway, your tomatoes look wonderful. I hope the whole Folksy think get's sorted out. It's one reason I don't sell anything. It sounds too complicated. I think we need a chutney post next! Wow the bedspread is going to look spectacular! LOL @Ros with the chutney. I'm just up the road from you listening to the gales in Southport, I can wave across the rather angry sea just now. Well done on the bedspread, on my list of to-do's one day too. Looking forward to seeing the bedspread grow! My Toms have been a complete failure this year:( Hardly any crop at all! That blanket is going well though. Thinking of wrapping up and hibernating for the winter when I look at it LOL! I totally agree about the whole Folksy thing. I was (and still am I guess) considering selling some things on there, but maybe a little bit more wary now! Looking forward to seeing how you get on with the Epic bedspread! If you place a banana in with your tomatoes, they will rippen up a treat. Have been thinking of using Folksy but not so sure now. Hugs Mrs A.
I always start off crochet with the best of intentions but get seriously bored after a few square . . . i admire the idea of an Epic Bedspread. I think the black and white combination is terribly chic! The bedspread looks fantastic. We've wondered whether to take the children to the blue planet, but probably one would run through and the other would want to spend hours at the first tank! your epic blanket is amazing, I am trying to crochet and really appreciate all the work gone into it.